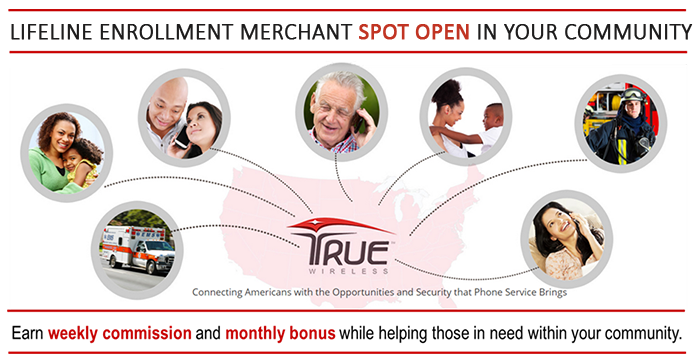 True wireless is actively seeking motivated merchants in OK, AR, MD, RI and Rio Grande Valley of TX to help qualified customers submit their application for enrollment to receive discounted or free wireless service and a free telephone. Over 95,000,000 Americans qualify for the Lifeline Benefit Program. Our potential and active customers need a local place to apply and or pay their monthly bills. Many are unbanked and rely on cash payments and local merchants for all their needs. If you have any customers receiving SNAP/EBT, or similar programs, they qualify for government subsidized wireless service. This makes your place of business a perfect location. Not only will you increase revenue by taking applications, but increase traffic to your store each month when customers pay their bill.